For the month of March, the Nightmare Factory Book Club has been circling the city of Austin like a swarm of sharks hypnotized by a premonition of gore in the water. BookPeople, situated at the nexus of this vicious loop, has already begun to feel an ominous tugging at its periphery as the centrifugal force of evil pulls at it from all sides, the vortex stripping it of its carapace tangent by frenzied tangent. The maddening storm will descend on the bookstore this Tuesday March 15th at 7:00 p.m. with CoffeePeople set directly in the hurricane’s breathless eye as the Nightmare Factory coalesces to feast on the steaming viscera of Junji Ito’s mesmerizing, psychotropic freakout Uzumaki: Spiral Into Horror. Something is haunting an isolated fishing village on the coast of Japan. It isn’t something that can exactly be defined with language. It isn’t something tangible, but its effects are concrete. It isn’t even dangerous, but it has killed over and over again for as long as time has existed. The people of Kurôzu-cho are possessed by a simple design, an obsession which quickly and irrevocably comes to dominate the life of every townsperson. The power of the spiral is undeniable and inescapable. The power of the spiral transforms everything it infests. 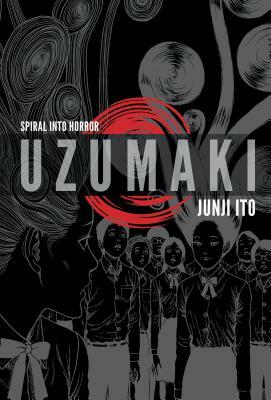 Uzumaki: Spiral Into Horror is a singularly powerful work of surreal phantasmagoria that fascinates as it repulses, indelibly altering the perception of the written word and the printed image. Join the Nightmare Factory Book Club to digest this elaborately upsetting story of elegant, geometrical terror. The Nightmare Factory meets on the third Tuesday of every month at 7:00 p.m. in the cafe at BookPeople to discuss macabre fiction of all shapes and sizes, so take shelter from the lashing winds with central Texas’s preeminent horror book club this Tuesday and examine this delirious work of graphic fiction from a different angle. Previous Post Strong Readers and Strong Women!